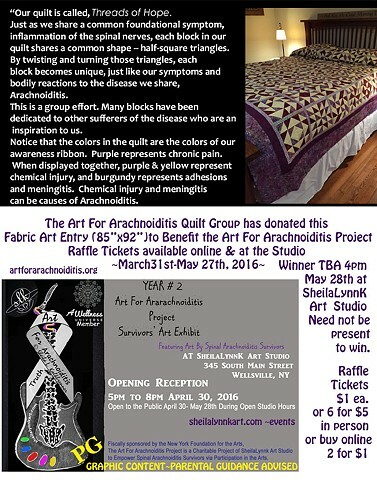 This Exhibit, Featuring Art by Arachnoiditis Survivors, will Open at SheilaLynnK Art Studio April 30th and be FREE to the public during Open Studio Hours until May 28th 2016. This Survivors' Art Exhibit may contain some graphic medical imagery which may not be appropriate for some viewers. Parental Guidance is advised. CONTACT the studio if you have any questions about this event. Studio visits also available by appointment.